HB Essentials Compact Type 22 Double Panel Double Convector Radiator White. Manufactured in accordance with BS EN 442. Supplied with wall mounting brackets and fixings. The classic design of the HB Essentials Compact Type 22 Double Panel Double Convector Radiator is the perfect heating solution for pumping more warmth into your room without sacrificing vital furniture space. With its 10-year quality guarantee, you can rest easy knowing that your HB Essentials radiator will work flawlessly and provide reliable warmth for many years to come. In comparison to single convector models of a similar size, the HB Essentials Double Panel Double Convector Radiator produces more warmth, and the white gloss finish and steel construction makes for an unobtrusive, yet hard-wearing and easy to clean, addition to any room. Boasting more than five dozen different size combinations this model is also wonderfully versatile. The range starts at radiator heights of just 300mm - perfect for those tight spots - and works up to 750mm at the other end of the scale. There are even more options when it comes to width, running from 400mm all the way up to 2200mm. Range of standard and thermostatic valves available separately. Central Heating Convector Radiators - Explained! 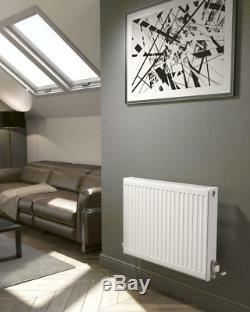 All Radiators (Convector's, Column and Designer) heat your room using Convective Heat. This is the process of Hot air rising within your room and pushing the cooler air towards the bottom of the room and thus coming into contact with the radiator. The Convector Radiator is designed to have Fins (Zig-Zag metal strips) which create a larger surface for the air to come into contact with. Hot water is circulated through a tube within the Convector which is surrounded by these fins. As with the other Radiators the hot air in the room rises and the cooler air is attracted to the Radiator. You should consider a Convector Radiators if: you are looking for a heating appliance that can heat the room quicker that Designer and Column Radiators. Central heating Radiators/Towel Rails are heated using your central heating system. The most important part of this system - for your Radiator/Towel Rail - is the boiler, and you most likely have one in your kitchen or bathroom. This boiler heats water, which is then circulated through the pipes behind your walls or under the floor to heat all of the radiators in your home or office. Single and Double Panel - Explained! Whereas, a Single Panel Radiator only has one panel which faces away from the wall. Because the design puts one panel behind the other, the height and width of the radiator will stay the same whether you choose single or double panel. Compared to the Single Panel options, the Double Panels will produce more heat because they have more surface area to warm the air in the room. You should bear in mind that this extra heat from a Double Panel will come at a higher cost. When browsing the Convector Radiators, you may see Double Panel Double Convector, this means that as well as having a panel on the front and back of the radiator, there is also an extra Fin (for explanation of what a Fin is, please see Convector Radiators Section) attached to the back panel. Double Panel Single Convector means that the radiator has both a front and back panel, but only one Fin attached to the front panel. Radiator Wall to Pipe Centres. Heat Output BTU (Delta T50). Heat Output BTU (Delta T60). Heat Output Watts (Delta T50). Heat Output Watts (Delta T60). 300mm x 400mm Double Panel. 82.5mm or 97.5mm. 300mm x 600mm Double Panel. 300mm x 800mm Double Panel. 300mm x 1000mm Double Panel. 300mm x 1200mm Double Panel. 300mm x 1400mm Double Panel. 300mm x 1600mm Double Panel. 300mm x 2000mm Double Panel. 400mm x 400mm Double Panel. 400mm x 500mm Double Panel. 400mm x 600mm Double Panel. 400mm x 700mm Double Panel. 400mm x 800mm Double Panel. 400mm x 900mm Double Panel. 400mm x 1000mm Double Panel. 400mm x 1100mm Double Panel. 400mm x 1200mm Double Panel. 400mm x 1400mm Double Panel. 400mm x 1600mm Double Panel. 400mm x 1800mm Double Panel. 400mm x 2000mm Double Panel. 400mm x 2200mm Double Panel. 500mm x 400mm Double Panel. 500mm x 500mm Double Panel. 500mm x 600mm Double Panel. 500mm x 700mm Double Panel. 500mm x 800mm Double Panel. 500mm x 900mm Double Panel. 500mm x 1000mm Double Panel. 500mm x 1100mm Double Panel. 500mm x 1200mm Double Panel. 500mm x 1400mm Double Panel. 500mm x 1600mm Double Panel. 500mm x 1800mm Double Panel. 500mm x 2000mm Double Panel. 500mm x 2200mm Double Panel. 600mm x 400mm Double Panel. 600mm x 500mm Double Panel. 600mm x 600mm Double Panel. 600mm x 700mm Double Panel. 600mm x 800mm Double Panel. 600mm x 900mm Double Panel. 600mm x 1000mm Double Panel. 600mm x 1100mm Double Panel. 750mm x 500mm Double Panel. 750mm x 600mm Double Panel. 750mm x 700mm Double Panel. 750mm x 800mm Double Panel. 750mm x 900mm Double Panel. 750mm x 1000mm Double Panel. 750mm x 1100mm Double Panel. 750mm x 1200mm Double Panel. 750mm x 1400mm Double Panel. 750mm x 1600mm Double Panel. SPECIAL ARRANGEMENTS FOR PALLET DELIVERIES. The drivers are only insured to deliver goods to the curb and are not required to carry goods into your home. If you find any damage, please sign the pallet as'DAMAGED' and the driver will take the damaged pallet away. If you are having multiple items delivered and only some are damaged, please sign'DAMAGED' for the goods that are damaged. If someone else will be signing for your goods. If someone else is signing for the goods on your behalf, you agree to ensure that your nominated signatory checks the goods prior to acceptance. Choosing the right accessories for your new Radiator or Towel Rail. The type of valves that you need will depend on the configuration of your pipework. If the towel rail / radiator has connections at the bottom. Corner Valves if your pipes are coming from the wall this will also give a 90 degree angle into the side of the radiator however is the neatest solution with this type of configuration. The item "Compact Convector Radiator White Type 22 400 600mm Central Heating Double Panel" is in sale since Thursday, August 10, 2017. This item is in the category "Home, Furniture & DIY\Heating, Cooling & Air\Air Conditioners & Heaters\Radiators". The seller is "essentialshoppinguk" and is located in Colchester, Essex. This item can be shipped to United Kingdom, Ireland.